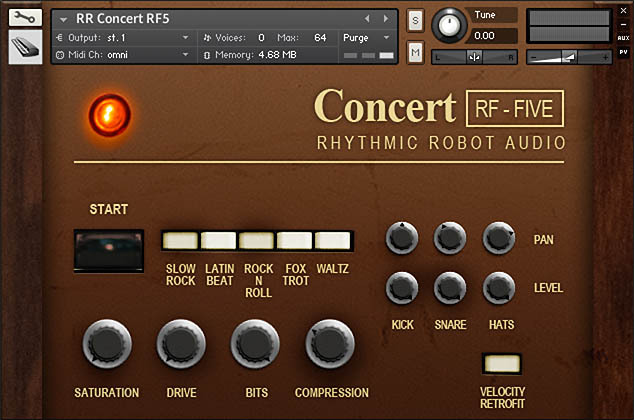 Another car-boot-sale score by Mongo, the Concert RF-FIVE is a little wood-veneered preset rhythm unit featuring five onboard rhythms (hence its name) and a lovely warm, mellow sound. We particularly like the kick, which is thick and almost woolly played “raw” but which comes to life in a really interesting way if you dial in some saturation and compression: you can hear this in the second audio demo, where we’ve cranked the controls a bit to give the sound some extra heft. 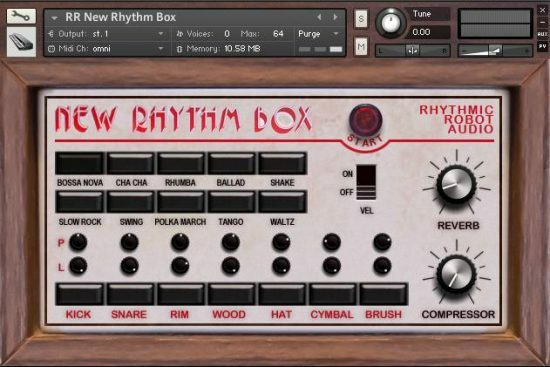 The snare is very laid-back and the hats tick away very nicely… plus there’s a neat little woodblock / click sound hidden away in there too. 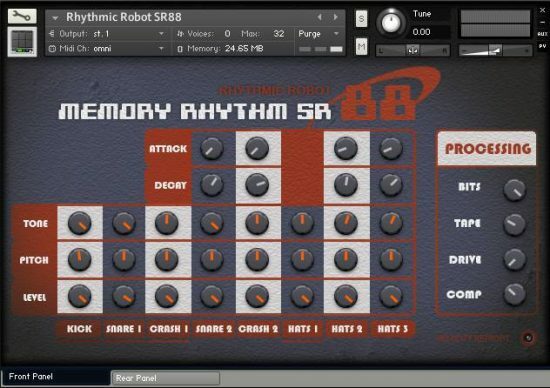 All five preset rhythms sync straight to your DAW tempo and are combinable, so you can splice together weird and wonderful mashups of the originals, or just use them as fills and layer patterns over your own beats (which is what we did at the end of Demo 2, in fact). The individual kit pieces are split out as usual so you can use them to craft slightly more modern grooves than “foxtrot”; plus of course there’s level and pan control for them, and Velocity Retrofit so that more humanised patterns sound authentic. It’s a very simple little box, just like the original! (All our Kontakt instruments require a full copy of Native Instruments Kontakt v4.2.3 or higher (including all versions of Kontakt 5). 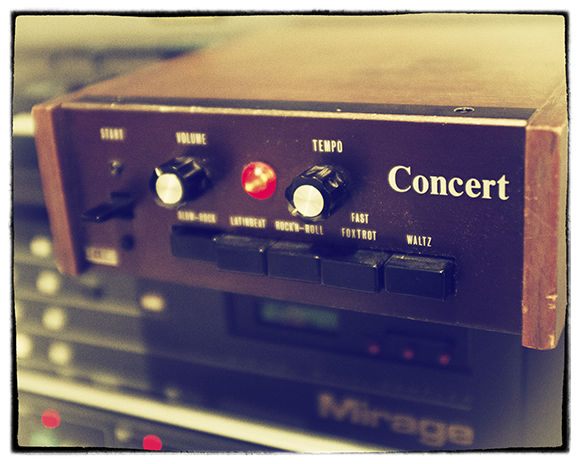 Kontakt Player is not supported: instruments will load, but will time out after 15 minutes. See the FAQ for further information.) You can read more about the original TR505 here and here. 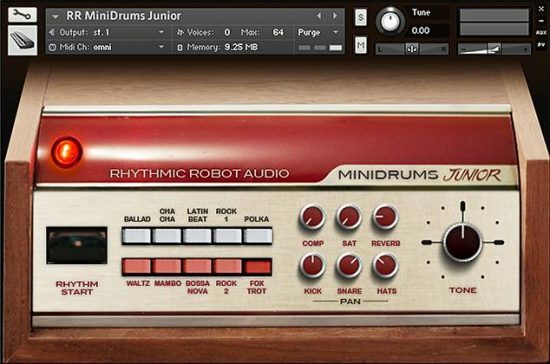 Nice little drum machine. Simple to use, useful sounds, fun to play along with. Well worth the few euros. Very funky! 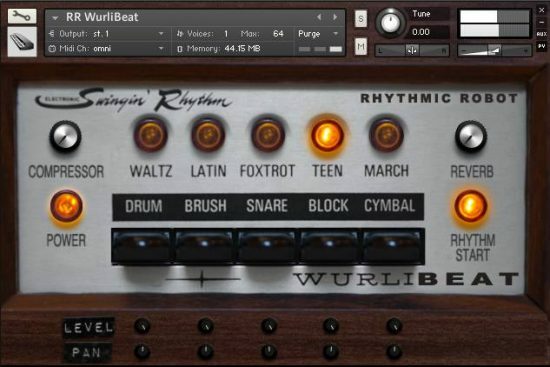 The drums have a very warm and mid-rangey tone, which can be a nice change typical drum libraries. Nice vibe. Lots of noise artifacts in the background, which I assume must be from the original instrument recordings. These are most recognizable on the looped patterns, but I do not find them to be distracting given the context of the offering.